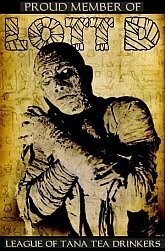 Midnight Movie of the Week #30 - C.H.U.D. 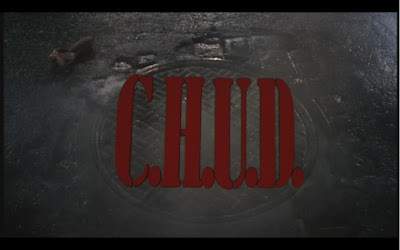 If you know both definitions of the acronym C.H.U.D., you're OK in my book. The DVD artwork gives away the one you need to know to enjoy this film - Cannibalistic Humanoid Underground Dwellers. 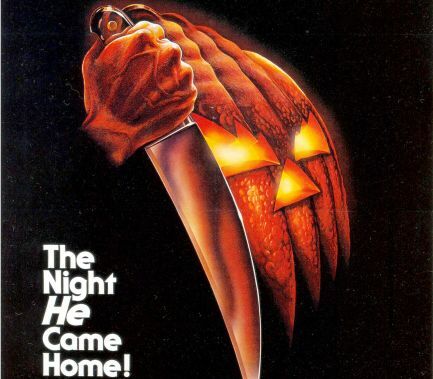 It's one of the most sensational titles in the history of horror cinema, but it's also a bit misleading. That's not because the film doesn't have Cannibalistic Humanoid Underground Dwellers...believe me, it does....it's because one would probably expect something very different from a film with that title. 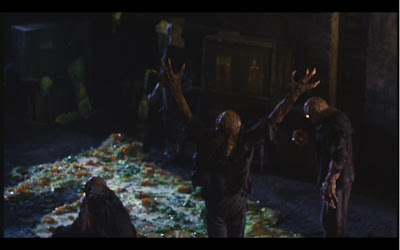 If you're like I was before I saw the film, you might expect a cheesy romp in which zombie-like creatures chow down on unsuspecting folks. You'd be right, to an extent. But I doubt you'd expect a film that takes its time setting up a human plot, introducing interesting characters, and plays the whole thing with a straight face. It sounds completely crazy, even to someone who's seen the movie half a dozen times. In the midst of the excessive eighties, C.H.U.D offers a focus on story and character that seems more like the horrors of the 1970s or the sci-fi monster flicks of the 1950s? Shocking, but mostly true. There are some slips here and there - at one point a woman with a gun is pushed off screen and disappears from a scene that's set in a confined area - but the film, from director Douglas Cheek, has its head on straight as a horror film despite its ridiculous premise. It's easy to see the influence of city-bound horrors of the earlier part of this decade (Alligator and Wolfen come to mind) on the tone Cheek takes with his film. 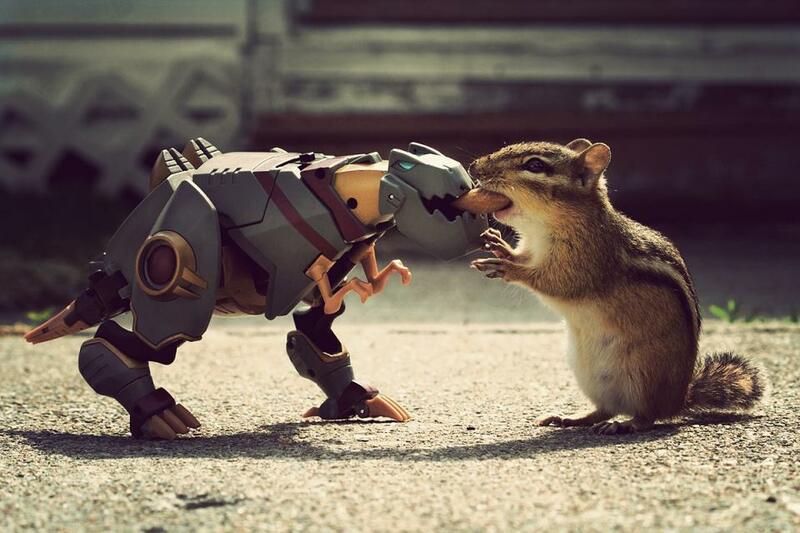 Within this serious tone, C.H.U.D. 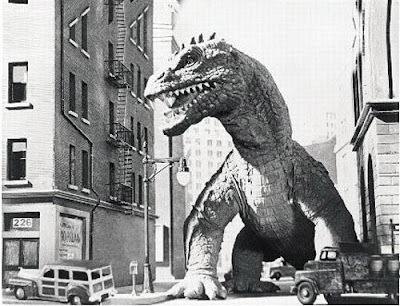 most definitely has some moments of monster movie brilliance. The creatures are wonderful, if not slightly bland, and that C.H.U.D. growl sound effect belongs in a monster hall of fame. The characters, led by future Home Alone stars John Heard and Daniel Stern, all buy in to the C.H.U.D. universe and sell what the film is offering without smirking. Manhunter's Kim Greist gets to offer some screams of terror that remind of the blondes-in-peril of the 1950s (and gets to wield a sword! ), and there's even a shower scene that allows the movie to join the ranks of the best Psycho imitators. 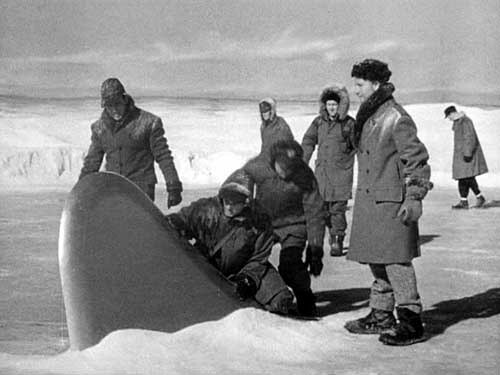 One scene even seems to have been directly lifted for James Cameron's Aliens two years later. (Unrelated to the rest of my review, but it must me said: I tried my hardest to count how many times the name Bosch, which belongs to the police captain played by Christopher Curry, was spoken in this film. After about 50 minutes, I lost count around 25. Someday, I'll complete this goal. If you're into games which require someone to partake of something when something happens on screen, look no further than BOSCH.) I've still never gotten over how much I dig C.H.U.D. Its fusion of monster movie and social commentary, gritty modern setting, and intelligent, well-acted characters are one-of-a-kind. 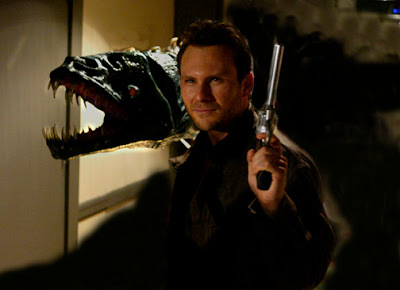 I know it seems ridiculous to say with a straight face, but if the cast and crew could do it, so can I. C.H.U.D. is a near perfect midnight movie treat. 2004, Dir. by Brian Paulin. It's been a long time (about 6 months, maybe) since my good man Zach S. from over at ZforZombies.com recommended that I check out Bone Sickness. I didn't really know Zach at the time, as I was just starting to mingle with other horror bloggers and only knew him as one of the few followers I had on this site. When I took a look at the movie's IMDB page, where I quickly found some unflattering images and a low overall rating from users...I kinda thought that he might have been doing what the British call "taking the piss". But when Zach (who I now know is definitely legit...possibly too legit to quit) recently recommended the film to me again, I figured I'd take the plunge. This, Bone Sickness happened to me today. Am I down with it? We'll start with the plot. Kristen is married(?) to Alex, who's very sick. Her friend Thomas (played by writer/director Paulin) works with the dead, and offers her some "herbs and stuff" that should cure Alex while his hot wife is away. we quickly learn that the items he's been giving her, which look like a McRib Sandwich when removed from a corpse, are turning him into a "necrojunkie" who needs more flesh and becomes kind of a zombie. In the meantime, actual zombies happen. Are they upset because he has been (unknowingly) eating them? I think so. Carnage follows. Let's get straight to the point of this one. Bone Sickness, which appears to have been produced on a budget of approximately "last week's left over cans and bottles", is about as inventive with its gore as any super-low budget zombie film I've seen. This isn't one of those "just cut away because we can't afford effects" films, nor is it one of those "we'll say it's a zombie movie but not actually have zombies until the final minute" (Zombies Gone Wild, anyone?) films. There's a lot of splatter. It's not long into the 98 minute runtime that we've got Alex puking up worms (while I was eating fish sticks, too! 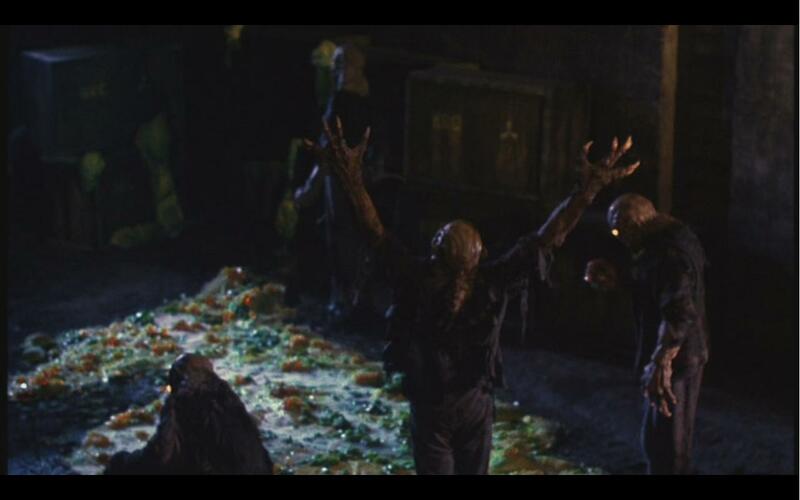 ), and later we get people ripped apart, full on eaten, and dismembered in plenty of ways. There are entire segments of the film which are just gore. We're talking minutes upon minutes of gore in a row. None of it looks too great - as I said, the budget is a constraint - but they at least offer it. The gore doesn't hold up too well, and this definitely isn't Fulci, but it did get to my stomach based simply on the amount of gore and how it combines with fish sticks. 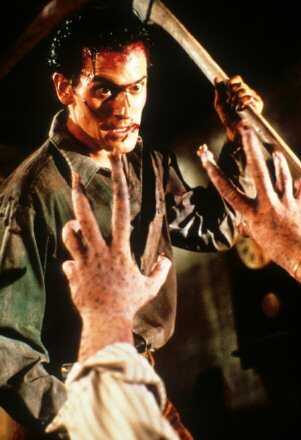 Since we're comparing, I could say that there are shades of Romero too, with some really brief social commentary in the final scenes, though comparisons to horror maestros must end there. 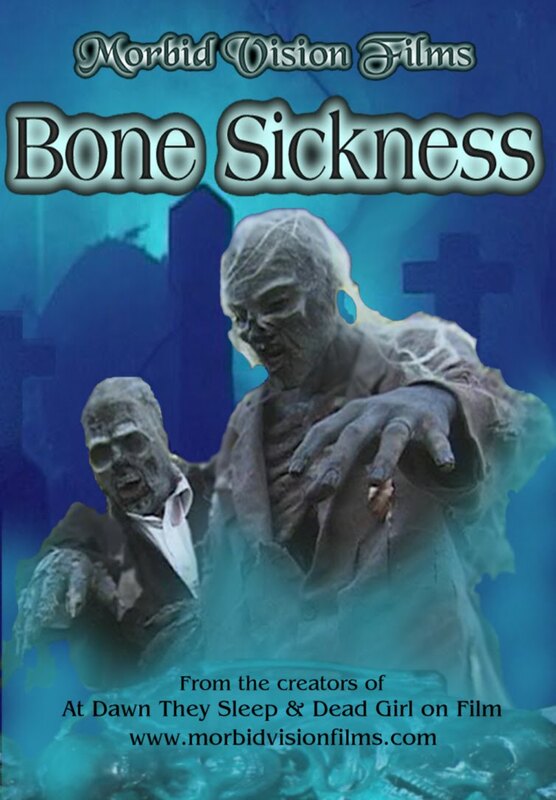 Bone Sickness is as amateur as it can be in almost every category (the women do look pretty good in the pre-zombpocalypse gratuitous nudie scenes). The plot offers some new stuff with Alex's dilemma, but is paint-by-numbers in every other regard. None of the actors seem too interesting, and the film could definitely have been pared down a bit by the director and editor. None of it really seems too worthy of ridicule, either, and it didn't seem like the kind of film you could sit down and riff with friends for fun. If you're interested in a film that's all about gore, you can do a lot worse than Bone Sickness. And it's far above a lot of zombie drivel I've seen lately. I'm not a splatterhound, so I grew tired of the film at points, but in the end found myself glad to have seen it. I'm not sure if I really recommend it based on my personal preferences, but I can see why it could gain a cult following. Welcome, Midnight Warriors, to 1960...the year of the STARE. 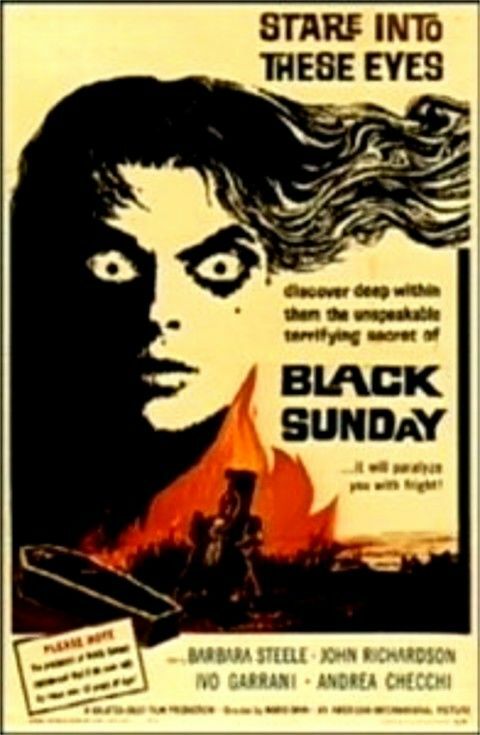 In one corner is Italian maestro Mario Bava with what most consider his "masterpiece" - Black Sunday. In the other, Director Wolf Rilla teams with George Sanders and a pack of creepy albinos for Village of the Damned. It's entirely worth mentioning that this throwdown could have been between the 1977 blimp-versus-Super Bowl thriller Black Sunday and the 1995 John Carpenter helmed remake of Village of the Damned. In that case, this matchup would have sucked. Starring: Barbara Steele, John Richardson, Andrea Checchi. 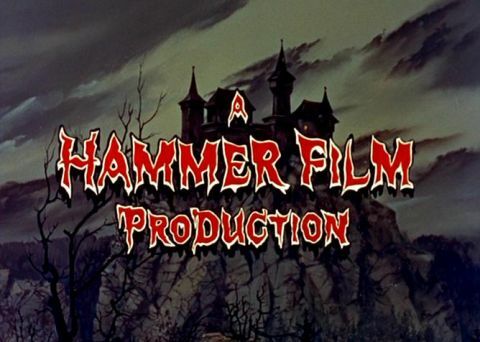 Starring: George Sanders, Barbara Shelley, Martin Stephens. This one's a windmill, tongue-out, slam dunk. I don't know anything about Wolf Rilla. I keep misspelling his name as Wolf Rolla, probably because I think he's like that Rock'n'rolla movie mixed with werebeasts. To put his career in perspective, this film has over 4,300 votes on IMDB. Rilla's next most popular film, Cairo (apparently a remake of The Asphalt Jungle?) has 88 votes. 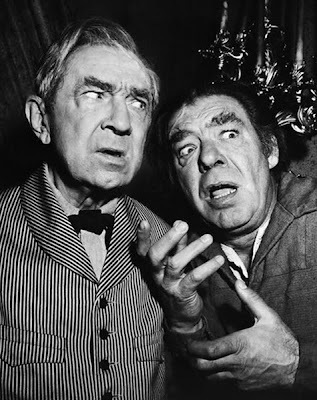 If you were ever to walk up to me, or perhaps comment on my blog, and ask "Hey The Mike, who's the most amazing actor of all-time that no one ever seems to talk about? ", my answer would DEFINITELY be George Sanders. He's absolutely, positively, one of the best character actors of all-time. Just go rent All About Eve and The Ghost and Mrs. Muir and Rebecca and Man Hunt (ahhhhh, especially Man Hunt, he's so freakin' a good Nazi! ), and then come back here and tell me he's not awesome. I DOUBLE DOG DARE YOU! This, to me, is where Village of the Damned slips. Those kids are creepy, it's true. But then the whole "think of a brick wall" thing happens and...for whatever reason, it seems a little silly to me. Sanders has a few moments of being over the top while dealing with the silly aspects of the plot (but is still totally awesome), and the film seems to get a little off-track despite its short runtime. This is an incredibly tough category to call. I've never really called either of these films a "favorite" horror film, but I definitely have always respected them both greatly. Normally, when I start one of these Throwdowns, I have an idea as to which film will come out a winner, based entirely on a gut feeling. Right now, my gut seems a little confused. John Carpenter has long been my favorite director not named Hitchcock, and I will absolutely admit that I saw his version of Village of the Damned (a remake that looked fantastic to 14-year-old The Mike) long before the original film hit DVD and became available to me. So I've always had trouble getting past that crappy remake when thinking about the original film. In fact, I'm starting to wonder if the silliness I attribute to the plot is because of how silly the remake was. 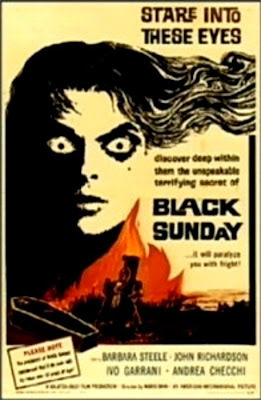 On the other hand, Bava's Black Sunday was long a "must find" movie for me. It wasn't until my sister graduated from college in Connecticut (while I was stuck via plane in Chicago during a storm and missed the festivities and following trip to NYC), that my parents kindly brought a DVD of it (and a Leatherface bobblehead doll which totally still watches me as I sleep) home to me. I must admit that I was not initially infatuated with the film - hype was cruel to it - but have grown to dig it greatly with time. I'm completely rambling. Because, when I started this Throwdown, I had absolutely no idea which of these films I would pick. 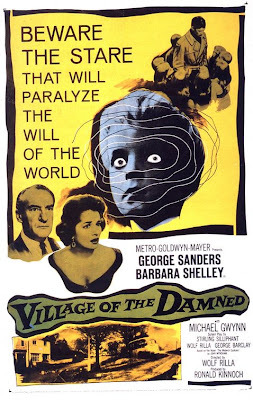 I kind of felt like I wanted to pick Village of the Damned, just because it's less talked about and I love George Sanders, but at the same time I couldn't imagine not honoring the tradition of Bava and Steele and the technical mastery shown in Black Sunday. OK, I don't know if it's going to be super, but it's exciting to me. For a long time I've hidden the fact that I, The Mike, occasionally do things besides watch and write about horror and genre and cult cinema from you all. It's true, it's true. See, I always wanted to have somewhere to write about other stuff, like random "other" movies I see and sports and being awesome, but never felt it fit here at FMWL. Meanwhile, I've long had friends in "the real" who I've thought would be excellent bloggers in their own ways. After prodding them for a while, they agreed, and after prodding me to help them start for a while...something finally happened. Fear not, FMWL is still and will always be my baby, and I don't anticipate my posts here becoming any less frequent. But it's a new day in my blog world, and I'd be honored if any of you who think it might be interesting will click on over, meet the gang, and welcome these fine folks to Blog-town. If nothing else, we'll be fun to watch. I swear. * indicates that The Mike didn't check the accuracy of this information. 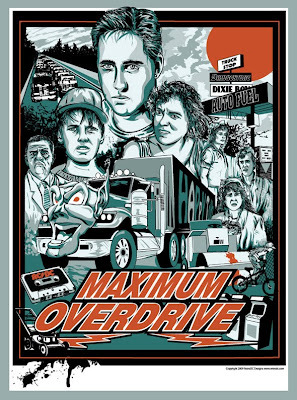 When I think about cheese as it pertains to cinema, Maximum Overdrive is one of the first films that comes to mind. I first encountered famed author Stephen King's directorial debut (which was also the last feature he directed) via the greatest program in the history of television - MonsterVision with Joe Bob Briggs. Watching the movie, with Joe Bob's commentaries on King's cameo (which couldn't be shown on TV at the time) and the soundtrack by AC/DC, was one of the first times I can remember loving a movie while thinking it was one of the worst things I'd ever seen. If you don't know the story of Maximum Overdrive, it's one of those perfect cases of a whole lot of talent producing something completely ridiculous. King put together a screenplay based on his short story "Trucks" (later adapted into another movie under that title), got a cast and crew led by '80s star Emilio Estevez together, got his favorite band to do the entire soundtrack, and seemingly had everything under control. Except his own demons, that is. 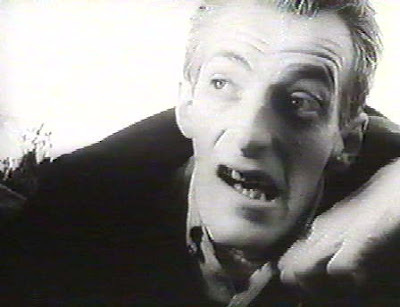 In recent years, King has stated that he "was coked out of his mind" for the entire production, and that he "didn't know what he was doing". That probably explains some of the accidents on set (a stunt gone wrong cost the director of photography an eye!) and might explain the early film scene in which a killer Coke machine takes down a little league coach and his team. The premise of Maximum Overdrive is simple. For some astronomy-based reason, all battery powered and/or electrical items on earth (plus some other basic mechanical items like gas pumps) develop minds of their own. Vengeful, violent minds to be exact. After a few introductory scenes, the meat and potatoes of the film takes place at the Dixie Boy Truck Stop, where parolee turned short-order cook Bill Robinson (Estevez) is forced to become a hero against a herd of angry semis, led by a black, goblin-faced rig from "Happy Toyz". We know Estevez' character is the hero of the story because a) he's the only person in the movie who looks like an actor, and b) the heroine, Brett (played by Laura Harrington), continually calls him "a hero". Meanwhile, trucks circle the truck stop. I think that's my biggest "problem" with Maximum Overdrive as an actual film. The first segment of the film is full of great gags, from King's cameo at an ATM Machine to the aforementioned Coke machine massacre (my personal favorite scene) and some hijinks involving Curt and Connie (the latter of whom is played by Yeardley Smith, who went on to voice Lisa Simpson), a couple of newlyweds trekking along the road to doom. But when the movie stops at the truck stop...it really does seem to stop. But really, by the time the lulls hit in, you know what you're getting from Maximum Overdrive, and should be in a forgiving mindset. 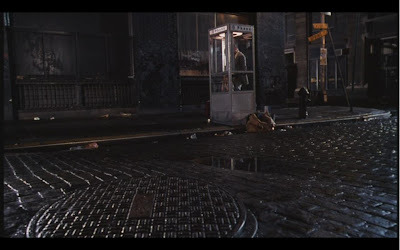 I mean, you've already seen future character actor Giancarlo Esposito get fried by a video game and a little kid ride around on his bike while people hang dead from their windows and sprinkler systems taunt him. You've heard Lisa Simpson whine and scream "CURRRTIISSSSSSSS!!!!!" a hundred times, and you should know whether you're in for the rest of flick or not based on your tolerance of that alone. Maximum Overdrive is a cinematic disaster, but it is generally delicious. 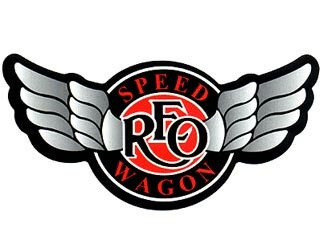 If you want ridiculous semi trucks, unnecessary bulldozers taking on children, and a bit of Angus Young's guitar mimicking Bernard Herrman, ain't no better flick to see. Congratulations must be offered to Stephen King, because what once was one of his greatest errs now lives on as a treat for B-movie lovers everywhere. 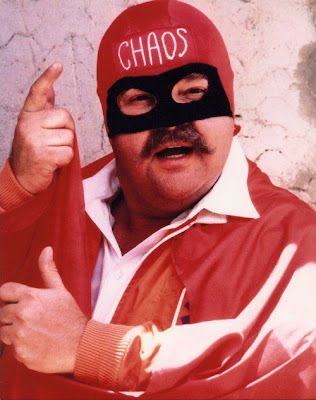 Hey Midnight Warriors, hope you're having a spooktastic weekend (or at least enjoying a random image of Captain Chaos). By now you've probably noticed that bloggers love MEMES. Me, I never even heard of that word before I started blogging. Totally looked it up finally, too. Basically, it means a cultural thing that spreads like herpes. But in this case, thanks to Pax over at Billy Loves Stu, is awesome. Before that, a couple more thank yous need to be given to blogs that have mentioned FMWL in the ongoing Blog Award things this week (which, according to my understanding, is definitely a MEME!) Thanks to Matt over at Chuck Norris Ate My Baby, Micah over at 365HorrorMovie.com, and The Girl Who Loves Horror over at...The Girl Who Loves Horror! All fine folks with better than fine blogs! Or maybe they're better than fine folks with fine blogs. Either way, they're awesome, and you should check them out. Hopefully, some coherent thoughts amidst droolings about movies I love. 2: During What Cinematic Era Where you Born? 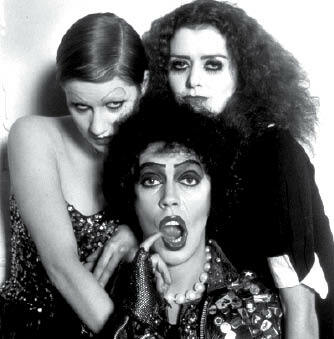 Ain't no party like a Halloween Era tea party. A: Billy Nolan or Tommy Ross, who would you take to the prom? B: Sue Snell or Chris Hargensen, who would you take to the prom? Well, it's definitely between Sue and Chris, but do I really have to go to the prom? I guess I'll pick Chris, because if she cops a 'tude I can leave her on the curb and go home to watch horror movies. 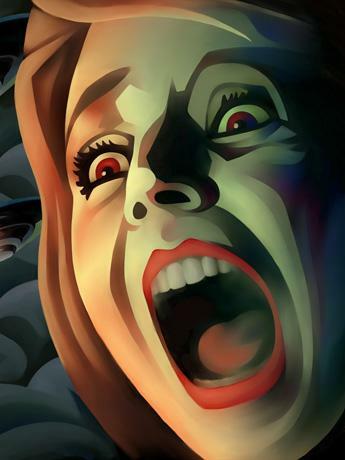 4: You have been given an ungodly amount of money, and total control of a major motion picture studio - what would your dream Horror project be? Not necessarily a horror project, but I've always wanted to see a Buck Rodgers/Flash Gordon-esque space epic/fictional biopic featuring '80s singer Kim Carnes battling an evil space princess with Bette Davis Eyes. For horror, recently I've been obsessed with someone making a monster movie about CRACK SQUIRRELS. 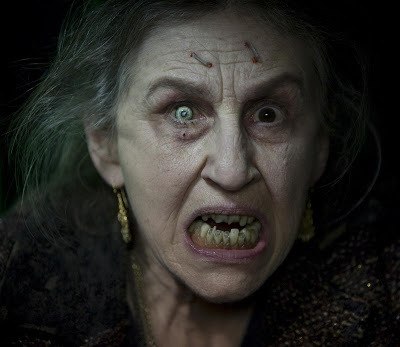 5: What horror film "franchise" that others have embraced, left you cold? Gonna get some guff on this one, but I've never bothered to see all of the Nightmare on Elm Street films. 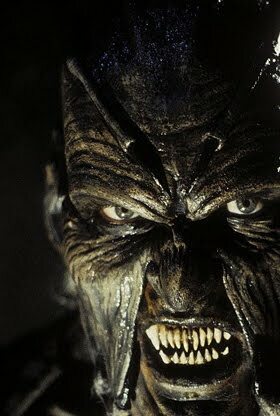 The first one's ending turned me off on Freddy and, while I love Dream Warriors, I just never really got into it completely. 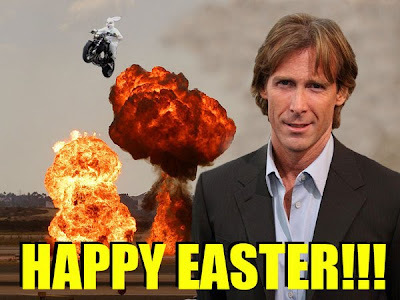 6: Is Michael Bay the Antichrist? 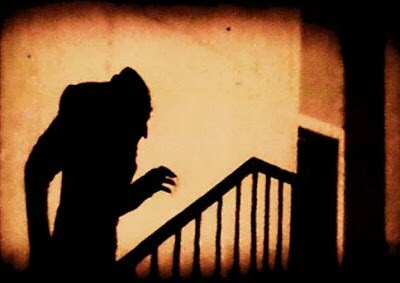 7: Dracula, The Wolf Man, The Frankenstein Monster - which one of these classic villains scares you, and why? 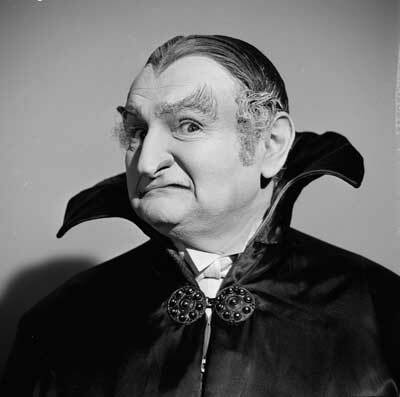 Always felt sympathy for Wolfie and Frankie, so in general I guess I'll go with Dracula. In a fight, Wolf Man. 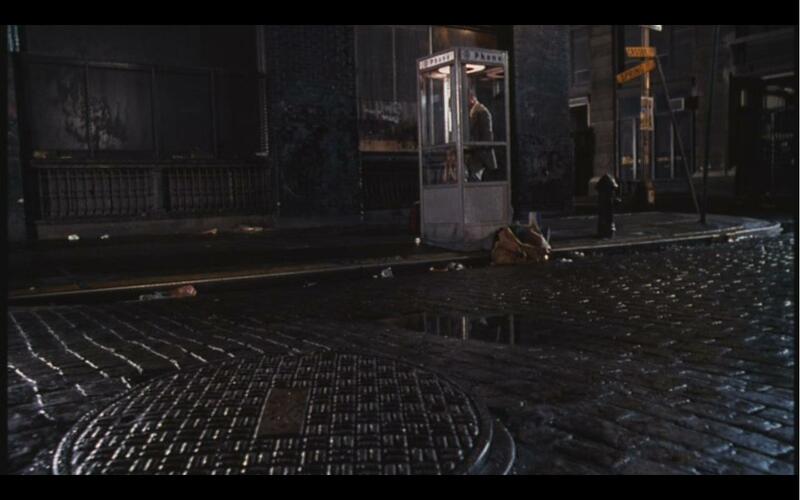 Recently, the icy stares of Marion Cotillard in Inception sent shivers flying down my spine. 9: Baby Jane Hudson invites you over to her house for lunch. What do you bring? 10: So, between you and me, do you have any ulterior motives for blogging? Come, on you can tell me, it will be our little secret, I won't tell a soul. While I don't deny the occasional dream of actually getting paid to write and not having my day job, mostly I just want to interact with horror fans and cult movie lovers. I live in Iowa, there are two horror fans in this state. 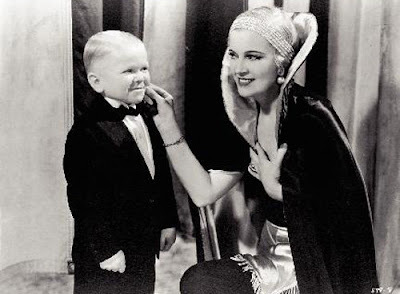 11: What would you have brought to Rosemary Woodhouse's baby shower? Two exorcists. 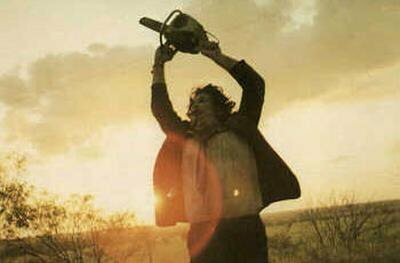 And a hatchet. 12: Godzilla vs The Cloverfield Monster, who wins? Godzilla. Ain't no way he's leaving my beloved Minilla an orphan. 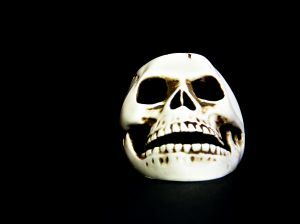 13: If you found out that Rob Zombie was reading your blog, what would you post in hopes that he read it? Umm, I'm pretty sure I've dissed him enough that I wouldn't need to post anything new. Except maybe a giant GO AWAY. 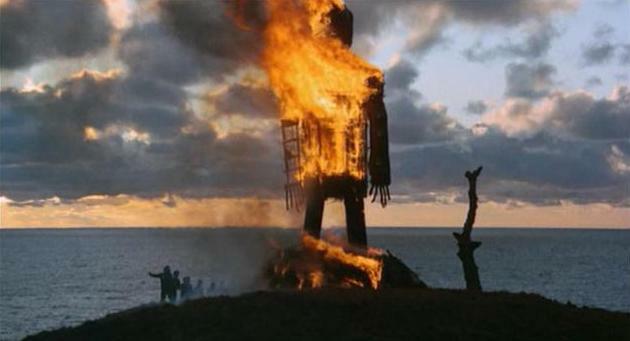 14: What is your favorite NON HORROR FILM, and why? 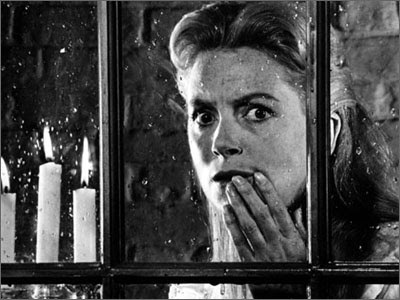 Rear Window has been my favorite movie for a long, long time. It's almost perfect. 15: If blogging technology did not exist, what would you be doing? Forcing my friends to watch movies they'd hate and getting frustrated about them not being as awesome as me, basically. "I killed them because I'm the ugly." I admit that I know a little bit about unnecessary use of the word "the", but that statement seems a little off to me. If I were someone with a psychology background who heard that confession from a serial killer, I'd be a little worried. In the case of The Ugly - a 1997 thriller from New Zealand - that's the confession offered by Simon Cartwright (played by Paolo Rotondo), a seemingly good-looking and soft-spoken young man who's killed plenty of people with a straight razor. Simon was picked on as a child, thanks to his timid nature and the fact he couldn't read well due to dyslexia. This led to an accident with some bullies that disfigured the left side of his face for most of his childhood, which only hindered his progress further. His single mother lacked sympathy, telling him that his deadbeat dad planned to come back to kill her and her ugly son; while also often abusing Simon physically and emotionally. Simon apparently embraced the ugliness by killing his mother, and now still sees his deformed past image every time he looks in the mirror. As we witness the life story of Simon via flashback and observe the behaviors of the clearly psychotic people who run the asylum that holds him (the most prominent guard is a dreadlocked and shirtless fellow with "INTENSITY" tattooed across his gut who looks like he just got out of a bar fight with Russell Crowe), it's easy to feel some sympathy for Simon. And when we see the adult Simon who's recovered physically, we really want to believe that there is a good side to him. Unfortunately for Simon, he hears voices. "The Ugly" speaks to him. The other star of our story is Dr. Karen Schumaker (played by Rebecca Hobbs, who looks a LOT like X-Files star Gillian Anderson), the aggressive psychiatrist who Simon has asked for in an attempt to sort out his story and clear his name. She's definitely a crusader type, determined to prove the sanitarium's head (who looks and sounds a lot like Hugo Weaving) wrong and to figure out what really was pushing Simon's buttons. Unlike The Silence of the Lambs before it, The Ugly doesn't spend much time on "quid pro quo". Simon is too weak go toe-to-toe with Dr. Schumaker, the same way he was too weak to fight back against his mother. 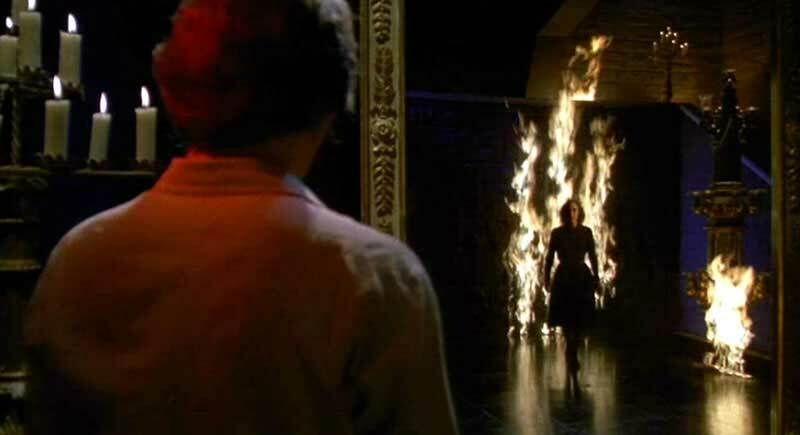 Though The Ugly definitely borrows from the Lecter formula, as mentioned above, the supernatural twists that come from "the visitors" clearly differentiate The Ugly's tone from that film. The viewer shouldn't get a rise out of the interaction between the killer and the questioning woman this time - one of Lambs' strong points - because The Ugly's focus is on harnessing how disturbed "Simple" Simon really is. 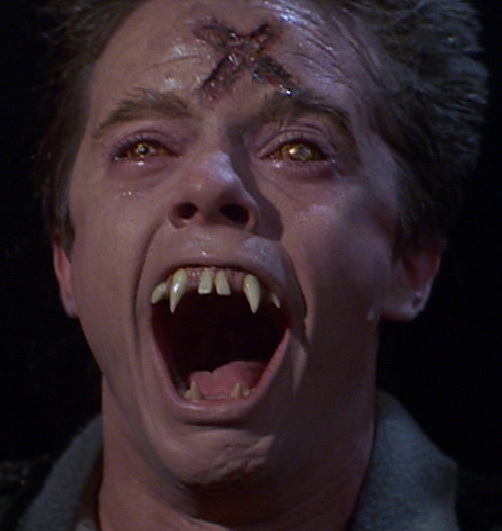 The film also plants Simon in a world of ugliness by replacing what we'd expect to be red blood with a black bile that adds a disturbing slime to the film. This ugliness is enhanced even further by the rare glimpses of Simon's "visitors", the gross specters he sees which seem to have been borrowed a couple years later for William Malone's House on Haunted Hill remake (and which also were spoiled back when they decided to throw it on that Boogeymen: The Killer Compilation DVD that almost every horror fan picked up back in 2001). Though the film was completely lost when it got a theatrical run in America in 1998 - smack in the middle of the era of shiny, bloodless, "hip" slasher films - this revisit has me more convinced than ever that The Ugly is one of the lost gems of modern horror. In fact, this feels a lot like the film Rob Zombie's Halloween films could have been, thanks to the focus on childhood trauma and scuzzy looking aggressors with visible chest hair. 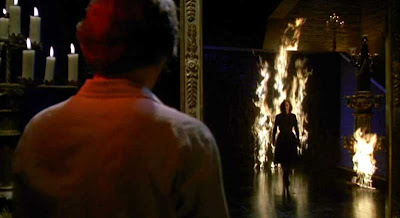 Unlike Zombie, first-time director Scott Reynolds doesn't try to go over the top with his visuals, letting the characters do the talking as the dull backgrounds add a dark tone without trick lighting or posters of old rock bands. 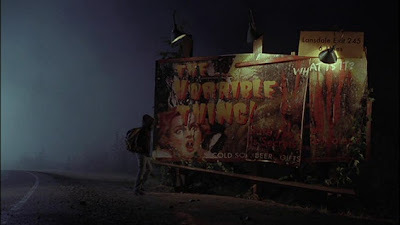 Bad advertising doomed it long ago (seriously, just look at that trailer below), but The Ugly is still out there, and I think it can win over most any horror fan. 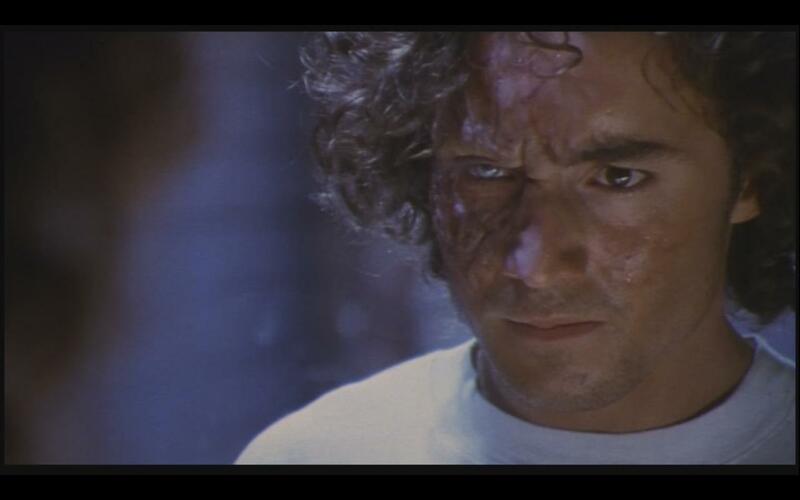 While there are a few too many "Nah, we were kidding, that didn't really happen" moments and the host asylum is clearly the worst run loony bin of all-time; The Ugly succeeds thanks to a psychologically interesting lead character (who's realized perfectly by Rotondo) and a few doses of unsympathetic gore. When the film gets as far as it can with Simon's story, the final touches are handled with a surprising simplicity that opens the mind just before the film fades to black. 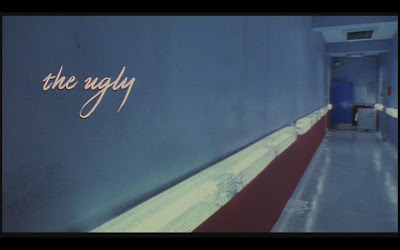 The Ugly might not answer all my questions about Simon - and I'd darn sure love to see Simon's story go on in future films - but it still manages to resonate as a deeply affecting thriller.